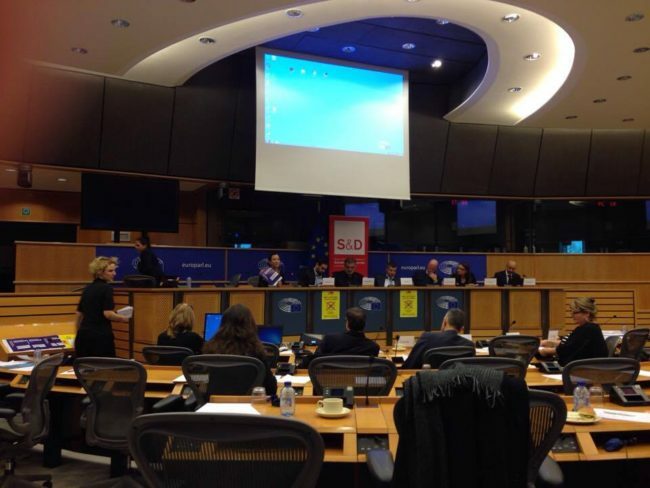 Damian Draghici, Romanian Member of the European Parliament in the Socialists and Democrats Group gathered some of the most outstanding antigypsyism experts at the European Parliament on the occasion of the Human Rights Day on 7 December 2016. Damian, a Roma musician from Romania who has been a Member of the European Parliament (MEP) in Brussels since 2014, invited participants from all over Europe to discuss the “lost cause of antigypsyism”. Each attendee demonstrated a substantial experience of Roma rights activism. They have now been gathered by Damian Draghici MEP to contemplate about changes to make to save the lost cause of Roma integration. Jamen Gabriela Hrabanova, Deputy Director of ERGO Network delivered a speech in which she pointed out the deficiencies of the Roma Inclusion agenda. Gabriela shared the shocking reality of 600 Roma people, including 200 Roma children, who were evicted in the outskirts of Paris while the meeting was going on in Brussels. She also elaborated briefly on the reference paper on antigypsyism drafted by ERGO Network’s antigypsyism experts. Jamen also added that saying the word ‘Gypsy’ has no moral stigma to it, therefore abusers would come from all ages and genders across all layers of society. Participants acknowledged that antigypsyism is a specific form of racism towards Roma and Sinti who get stigmatized as Gypsies in the public imagination. Soraya Post, Roma MEP from Sweden highlighted that the term antigypsyism should always be applied when communicating about Roma inclusion instead of discrimination. The audience was astonished to hear the results of the campaigns run in Romania to tackle antigypsyism in football. Valeriue Nicolae, new special representative of the secretary general at the Council of Europe also shared that he is building an international alliance to export results of the football campaigns run in Romania. He also elaborated on the involvement of Damian Draghici as musician primarily and not just as MEP to inspire Roma youth in Romania. Valeriu thanked Damian for the life making changes he achieved in the life of children through his contribution. Peter Niedermuller, Hungarian MEP from the Socialists and Democrats Group emphasized that we need to tackle antigypgyism in the national and international authorities as well as antigypgyism is present everywhere. Andrej Ivanov, statistics expert working as PhD Head of Sector on Rom and Migrant Integration at the Fundamental Rights Agency presented the EU-MIDIS report from FRA. As a reflection to the report he mentioned that there are several tools and resources already available for Roma however the information hardly reaches them and they rarely end up accessing opportunities. Irina Spataru and Laszlo Jakab represented the Roma youth at the event and they both encountered of a rather harsh reality from Roma youth all over Europe.